Our campus is conveniently served by several lines of public transportation. Getting to/from campus without a car is easier than ever! If you are unsure of the route that will get you to your destination, you can use NJ Transit’s Trip Planner. The Montclair State University NJ Transit train station on Clove Road and the Montclair Heights Station on Normal Avenue, provide rail service to New York City and the following New Jersey municipalities along the Montclair-Boonton line: Hackettstown, Netcong, Mount Olive, Lake Hopatcong, Dover, Denville, Mountain Lakes, Boonton, Towaco, Lincoln Park, Wayne, Little Falls, Montclair, Bloomfield, Glen Ridge, Newark (Broad St.), and Hoboken. In addition, through the Secaucus Junction transfer station, there is access to the Northeast Corridor, North Jersey Coastline, Main and Bergen, and Pascack Valley Lines. We encourage members of the community to explore rail use to and from the University as a viable travel option. For additional information, please check NJ Transit’s train schedules. NJ Transit Bus No. 11/28 serves the University, originating at the Bloomfield Ave. station, and also serves Wayne, the Willowbrook Mall Park and Ride, Little Falls, Cedar Grove, Verona, Montclair, Glen Ridge, and Bloomfield. NJ Transit Bus No. 191 serves the University bus stop at the Red Hawk Deck and the Montclair Heights train station, making stops between New York’s Port Authority Bus Terminal and Willowbrook. NJ Transit Bus No. 705 originates at Main Street and Passaic Avenue in Passaic and travels through Clifton to Montclair State University. From the west, NJ Transit Bus No. 705 originates at Willowbrook Mall and travels to Montclair State University. For additional bus schedule information, visit NJ Transit. DeCamp Bus No. 66 leaves from New York’s Port Authority Bus Terminal and select runs stop on campus at the Red Hawk Deck on weekdays. Check the Decamp bus schedule. Use the University’s Carpool Directory to connect with other people who are making the same trip. 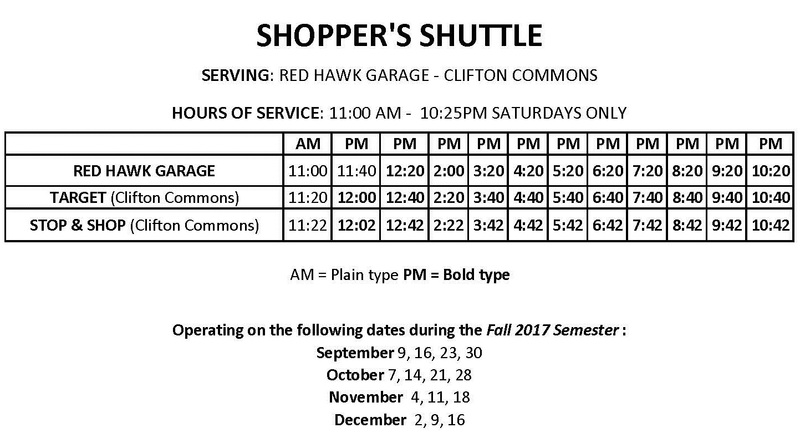 During the Fall and Spring semesters, the University runs a shuttle on Saturdays that transports students from campus (the Red Hawk Deck shuttle stop) to Clifton Commons shopping center. Check the Shopper’s Shuttle schedule. Montclair State has Zipcars located on campus in parking lot 20. Borrow a bike through the Recreation Center’s Hawk on Wheels program. Mountain Ave.: This train station is located on Upper Mountain Avenue and provides quick access to the Presby Memorial Iris Gardens, Mountainside Pool and Tennis Courts. Upper Montclair: This train station is a short walk from many shops, restaurants, Anderson Park, King’s Super Market and Acme Grocery Store. Watchung Avenue: This station is in Watchung Plaza which holds a variety of shops, services and restaurants. Walnut Street or Bay Street: The Walnut Street area also has a variety of shops, services and restaurants. Both of these stations are a short walk from the “Montclair Center” area of downtown Montclair. This area along Bloomfield Ave. has a wide variety of shops, services and restaurants. Additionally, from Bloomfield Avenue, a number of buses may be taken – the NJ Transit 28/11, 29, 34, 97 and the Decamp 33 all run along Bloomfield Avenue. To get back to campus, you will board on the westbound platform (towards Dover/Hackettstown). For other stops along the Montclair-Boonton Line, transfer or fare information, please check the train schedule. You can catch several buses at the Red Hawk Deck. NJ Transit Bus 11/28 serves the University, Wayne, the Willowbrook Mall Park and Ride, Little Falls, Cedar Grove, Verona, Montclair, Glen Ridge, and Bloomfield. To get into Montclair Township, board the 28 headed towards Newark. This route leaves campus, heads down Valley Rd, turns left onto Watchung Ave and then continues down Park St. until it reaches Bloomfield Ave where it turns left and continues into Newark. 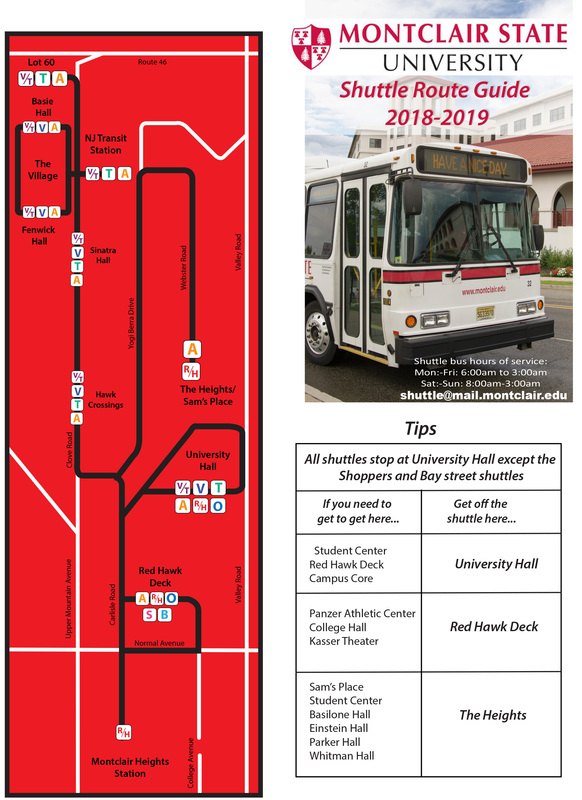 To get back to campus, simply board the 28 headed towards Montclair State University. The bus stop to get back is generally located across the street from the stop where you got off the bus. NJ Transit Bus 705 originates at Main Street and Passaic Avenue in Passaic and travels through Clifton to Montclair State University. From the west, NJ Transit Bus No. 705 originates at Willowbrook Mall and travels to Montclair State University. NJ Transit Bus 191 serves the University bus stop at the Red Hawk Deck and the Montclair Heights train station, making stops between New York’s Port Authority Bus Terminal and Willowbrook. Additional bus schedules are available on NJ Transit’s website. On weekdays, catch the train from the Montclair Heights station on Normal Ave. or the Montclair State University train station on Clove Rd. These trains go directly to NYC and Hoboken, with stops at Newark Broad Street and Secaucus. To get to Philadelphia, on weekdays, take the train to Secaucus and transfer to the Northeast Corridor Line (NEC) towards Trenton. In Trenton, you can switch to SEPTA which will take you into Center City Philadelphia. Make sure you check the NJTransit train schedule to ensure that you are on the correct train. 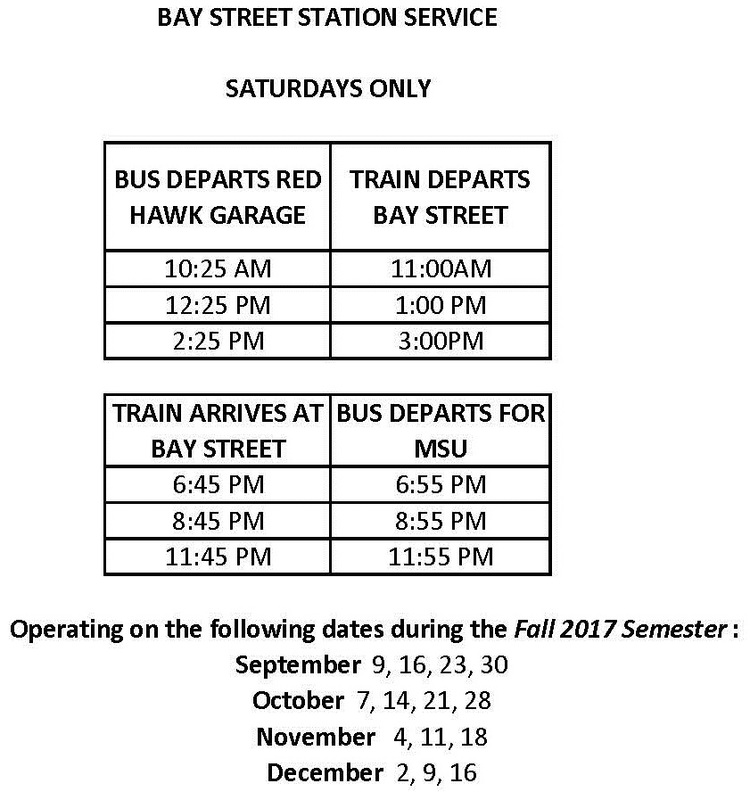 There is no weekend train service at Montclair State University or Montclair Heights, however, on Saturdays, you can take the Montclair State Bay Street Shuttle to the Bay Street Train station in downtown Montclair and take the train to Hoboken or New York from there. On weekdays, take NJ Transit’s 191 or the Decamp 66 from the Red Hawk Deck bust stop into NYC’s Port Authority Bus Terminal. On weekends, the Decamp 66 can be caught just off campus at the corner of Valley Rd. & Nassau Rd. To get to Hoboken on weekends, take the 28 bus to Newark Penn Station and transfer to the PATH train to Hoboken. Enter an address in NJ Transit’s Service Locator and you will be provided with information on which transit services are available near that address. NJ Transit’s Trip Planner will calculate a route and the fare between two addresses or stations. Trains from the Montclair Heights station on Normal Ave. and the Montclair State University train station on Clove Rd. head east into NYC and Hoboken, with stops at Newark Broad Street and Secaucus where connections to other services can be made; and west towards Hackettstown. Check the Montclair-Boonton train schedule. There is no weekend train service at Montclair State University or Montclair Heights. Check NJ Transit and Decamp to find bus schedules. Newark Liberty Airport (EWR) can be accessed via bus and/or train. On weekdays, take the train from campus to Secaucus and transfer to the NEC train with EWR listed. On weekends, take the 28 bus to Newark Penn Station then transfer to a train line with EWR listed. John F. Kennedy (JFK) and LaGuardia (LGA) airports can be accessed via NYC Transit. Philadelphia (PHL) can be accessed via SEPTA’s Regional Airport Line and buses 37, 108 and 115. Information on how to get to Philadelphia from campus is listed above. Check for transit delays and service advisories before you leave. Make sure you have exact change for bus fare. NJ Transit bus drivers do not make change, and Decamp bus drivers may not be able to make change for bills larger than $20. Be sure to purchase your ticket(s) before you board the train! Buy your ticket from a ticket agent, a Ticket Vending Machine, or the MyTix app. NJ Transit applies a $5 surcharge to tickets purchased aboard the train when a ticket agent or Ticket Vending Machine is available. Both the Montclair State University and Montclair Heights train stations have Ticket Vending Machines. Use the NJ Transit Trip Planner to plan a trip between two specific destinations. Use NJ Transit’s MyBus Now feature to get real-time bus arrival information! Use NJ Transit’s MyBus feature to find out when the next bus is scheduled to arrive. Call 973-275-5555 or text your bus stop ID number to mybus (69287). Montclair State’s bus stop ID number is 18141. Other bus stop ID numbers can be obtained by visiting the NJ Transit’s MyBus website and entering the street address or general location of the bus stop you are searching for. These ID numbers will also be posted on a sign at most bus stops. Save mybus (69287) to your phone contacts list for quick access. Many cell phones have a notepad tool. Use this tool to save your most frequently used bus stop ID numbers so you’ll have them on-the-go.